So what 850 snowmobile is the best? About half of the 850 riders say Polaris, the other half say Ski-Doo. And what’s most interesting is that each half claims their machine is not only a little bit better, but a lot better. 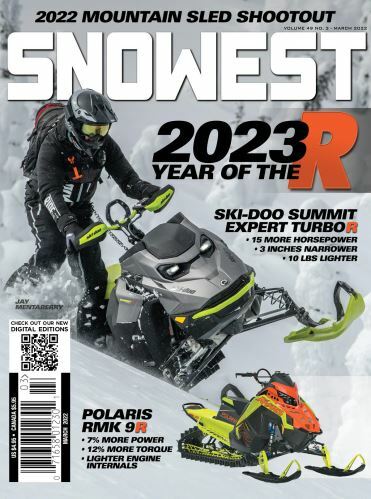 The editors at SnoWest Magazine also go back and forth on which snowmobile works the best. And again, depending on the day, the snow conditions and the terrain, our opinions often vary sharply. Both Polaris and Ski-Doo have strong engines and solid clutches that generate incredible horsepower. Both have a unique look to them. We suspect these features can come into play when trying to make a purchasing decision. But there are so many other features that can affect the quality of the ride. For some, it’s a whole bunch of little things that sway their opinion. For others, it’s one or two big things. So we’ve compile a list of all the “other” things that can come into play when trying to decide which 850 is best for you. 1) Suspension—This is where the design of the platform gets magnified. For the Polaris AXYS, it’s a rigid design—stiff and precise. For the Ski-Doo Rev Gen4, it’s a flexible design—soft and easy. Both platforms are designed specifically for mountain riding. Both suspensions are light and open in an effort to reduce snow buildup. Yet both work reasonably well down the trail. The real measure is how they handle in the snow. Polaris requires a combination of body English and throttle. You don’t need to lean too hard to set an edge, but you need to balance your weight position and your throttle to hold it. Ski-Doo is a little easier to initiate a turn since it’s slightly slower to react. For many, it’s just easier to control. 2) Running Boards—At first glance, you may wonder “what running boards?” There’s really not a lot of material on either. But both offer great footing and tend to do a great job in eliminating snow buildup. Ski-Doo boards are a tad bit wider and tend to offer a better working platform. That said, they also tend to hang up a bit in the snow. Since Polaris boards are narrower, they tend to glide better through the snow. Both allow you to work the edges, which allow you to use your legs for leverage. Polaris has a bar at the front where you can hook your tow for leverage. However, some snowmobilers find this bar counterproductive because you can also get your foot caught up on it if you lose your balance. 3) Track—Polaris has a 3.0-inch Series 7 track that features a paddle pattern of rows of two with them off-setting from the left side to right side. Ski-Doo has a 3-inch Powder Light with FlexEdge that features a pattern of two and one off-set. The flexible track (working in harmony with the flexible suspension) allows the Ski-Doo track to roll on its side with ease. Ski-Doo’s track is also an inch wider than the Polaris track, which provides a little better flotation while the Polaris track will provide a little better sidehilling.